Have a question on Peugeot 301? Peugeot 301 is available in 2 different colors - Silver and Brown. Watch latest video reviews of Peugeot 301 to know about its interiors, exteriors, performance, mileage and more. Peugeot is a French automobile company which is well known for its intelligently designed vehicles offering you one of the most advanced features. Its Peugeot 301 was introduced in the year 2012 and though, it has just been a couple of years since its inception, it has been accepted on a global platform very warmly. This sedan carries attractive exterior which speaks of its own style and an interior which has all those features to deliver comfort and convenience to its occupants. The soul of this sedan, its 1.6-litre 4 cylinder engine, works efficiently to prove its worth. Since this sedan is among premium vehicles, it comes under a not-so-impressive price tag but still it is competitive considering similar segment vehicles by other auto brands. Slide inside Peugeot 301 and you will get enchanted with the beauty its holds within. The beautifully crafted seats are not only comfortable but flaunt its own style. The interior is designed in such a way that it looks organized and spacious. You get a stylish dashboard with intelligently employed instrument panel at the front fascia. Temperature inside this sedan is controlled automatically with its climate control system. With all this comfort, the entertainment of its occupants is also well taken care. 301 sedan comes with a CD player, MP3, RDS, Bluetooth, USB, AUX and 4 powerful speakers. This infotainment system is incomplete if its 8-inch screen is left unmentioned. You can enjoy entertainment and navigation on this touchscreen employed at the centre of the dashboard. 640 litres of generous trunk space makes sure that you don't have to think twice while packing your luggage for a long weekend with family. Have a close look at the exterior of Peugeot 301 and you would yourself discover the reasons and features which make this sedan luxurious and classy. Peugeot itself is well known for its styling and it is well expected that all of its vehicles carry unmatchable design and Peugeot 301 is no exception. Its eye-catching silhouette and attractive bodylines make a style statement for its owner. Its front with stylish front grille and Peugeot Lion on the bonnet along with distinguishing headlamps, every feature speaks of elegance. This premium vehicle measures at 4442 mm x 1748 mm x 1477 mm (L x W x H) along with wheelbase of 2652 mm which makes this car decently spacious inside. The Access variant comes employed with 15 inch steel wheels as opposed to 15 inch alloy wheels employed in Allure variant. 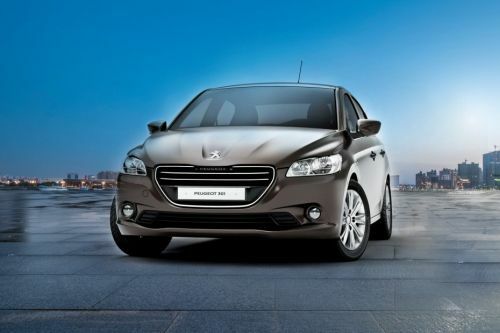 Peugeot 301 is available in 2 trims in UAE under the labels of Access and Allure. Both of these trims have a 1.6-litre 3 cylinder engine under their hoods. This engine has a capacity to knock out a maximum power output measuring 115 hp at 5050 rpm along with a maximum torque counting 150 Nm at 4000 rpm. This engine coupled with CVT transmission accelerates from halt to 100 km/hr in 10.5 seconds with a top speed of 188 km/hr. Coming to the fuel efficiency of this engine, it sips 6.5 litre/100 km of fuel on an average. The Peugeot 301 can be refilled with a maximum of 50 litres of fuel in one go. All the numbers delivered by this 1.6-litre engine looks decent. This sedan offers several active and passive safety features which ensure that you not only enjoy comfort but also have a safe ride. Airbags and seat belts for all the occupants are just basic safety features in this sedan. Other than this, Peugeot has been employed with automatic hazard lamps so that you may focus on the road and have a safe drive. Its Electronic Stability Program, Emergency Brake Assist, Anti-Slip Regulation, Dynamic Stability Control, Electronic Brakeforce Distribution and Anti-Lock Braking System, altogether, make sure that you enjoy a safe drive with your family. With all this and trusted suspension system which is committed to deliver a safe and comfortable ride, you can have a worry free drive everytime. Peugeot 301 is a compact car with loads of appealing features. You talk about comfort or power and performance, this sedan doesn't lack behind in any segment. Some of the attractive features are available only in top notch trim which might be a reason for a tad bit disappointment. What is the price of Peugeot 301? On road prices of Peugeot 301 1.6T Allure in is costs at AED59,900 . What are the colors options available in Peugeot 301?